GN Solids Control is especially good at providing turnkey solutions for solids control and drilling waste management systems. To date, GN Solids Control has built GN Solids Control (China HQ & 2 manufacturing plants), GN Solids America (Houston Branch Company with warehouse) and GN Solids Russia (Moscow Branch Company). GN Solids Control has helped global customers from over 72 countries and regions on the solids and liquid separation. In the first half year, GN Solids Control received on order for a Australian customer. They need a pretty complicated mud recycling system that demands all the control boxes and driven motors conform to IECEX and Australian standard. All the walkway, guard rails and lifting pads etc. strictly meet complicated safety rules. Tank grating is using high strength fiber glass. Besides, the welding and painting are also has strict rules to follow. This GN mud system is composed by 2 large parts: mud mixing tank and mud storage tank. A bentonite/ barite adding hopper is fixed on the top of the tank. It connects with 2 sets parallel centrifugal pumps on the tank skid, if one pump is broken the other pump can work immediately by changing control valves manually. 4 sets mud agitators are located on the tank top to keep the drilling mud from settling. Different compartments are divided in this mud mixing tank. Close the tank skid, there are several sand gates controlled on and off by manual butterfly valves for quick cleaning after using for a long while. After mixing, drilling mud is transferred to the latter mud storage tank. Here all the drilling mud is mixed to a specific gravity and density so it can be feed into the drilling rigs. 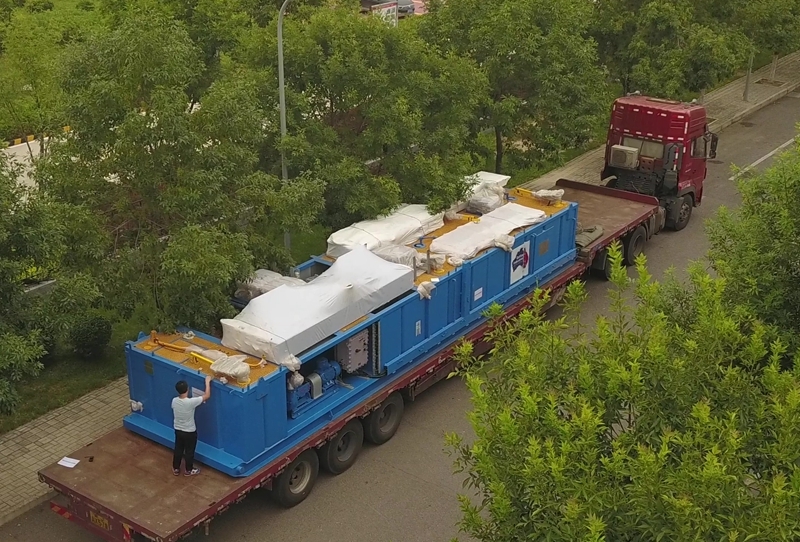 If we use some pretreating equipment in front of this system, such as GN shale shaker, decanter centrifuge, it will form a whole solids control treating system that collect the used drilling mud from drilling rigs and after treated to feed back to the drilling rig for reusing.